Music won't stop - News: The Norvins' album « Yoga With Mona » is out now ! 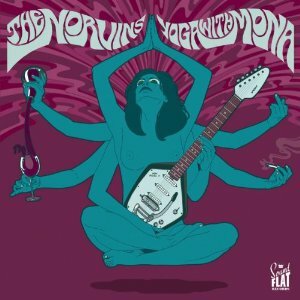 The Norvins' album « Yoga With Mona » is out now ! "The five Parisian Garage Rockers THE NORVINS, founded in 2004, have proven their talent to us already with their debut album TIME MACHINE. Now it's time for their second LP YOGA WITH MONA, which matches its predecessor in quality in every way. THE NORVINS remained true to their style: With its catchy organdriven melodies, wild guitars, a touch of harmonica, lead singer Edouard's forceful voice and an authentic 60's sound, the album is once again pure Garage Punk (not least because the band use original equipment). The influence and love of 60's Garage rock and its hits, amongst others compiled on NUGGETS or BACK FROM THE GRAVE, are clearly audible. 'Monk's Hangover' with the harmonica and 'Keep me posted' with its great beat remind one a bit of THE CHESTERFIELD KINGS, whereas 'Scream and Shout' and 'Yoga with Mona' have an energy which is comparable to GRAVEDIGGER V. Then again, 'Better of dead' is a slightly slower song with a psychedelic sound. Additionally, the album also includes a 'norvinesque' cover version of the classic 'It's a crying shame' by THE GENTLEMEN. Every one of the sixteen songs is a hit and will definitely make you want to dance! This band has a raw energy, like every rock'n'roll band should have it. Therefore, the new LP YOGA WITH MONA by THE NORVINS (available as LP and CD) is a must have for every Garage Punker."